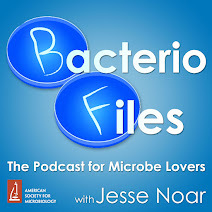 This episode: Bringing a fungus that makes zombie flies into the lab makes a good model for studying microbial mind-control! Thanks to Dr. Carolyn Elya for her contribution! Elya C, Lok TC, Spencer QE, McCausland H, Martinez CC, Eisen M. 2018. Robust manipulation of the behavior of Drosophila melanogaster by a fungal pathogen in the laboratory. eLife 7:e34414. What’s new: Now, Dr. Carolyn Elya and colleagues Tin Ching Lok, Quinn Spencer, Hayley McCausland, Ciera Martinez, and Michael Eisen, publishing in eLife, have studied the fungus's methods more deeply in fruit flies! 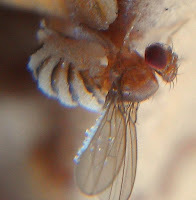 Exhibited same circadian patterns in lab; fungus kills flies near "sunset"
So I do have a fun story about the fungus, and basically the gist is that I isolated it from my backyard in California when I was a graduate student. So I was at the time collecting wild flies for a different project that I was working on in Michael Eisen's lab, and I noticed that in the bait that I had set out to catch these wild flies, there were some dead flies, and these dead flies were peculiar, they had their wings up at a 90 degree angle, and they had evidence that some sort of microbe had grown out through their skin. And very very luckily, I knew that these two features of cadavers are hallmarks of infection by a particular pathogen, fungal pathogen called Entomophthora muscae. So I knew that this was probably Entomophthora muscae, followed this up, confirmed that that was true, and that led me to isolating the fungus and bringing it into the lab to study.